I can honestly say, that even as a college student, I have never once drank before noon. This week started off with excitement: the LAST two days of clinical of nursing school! 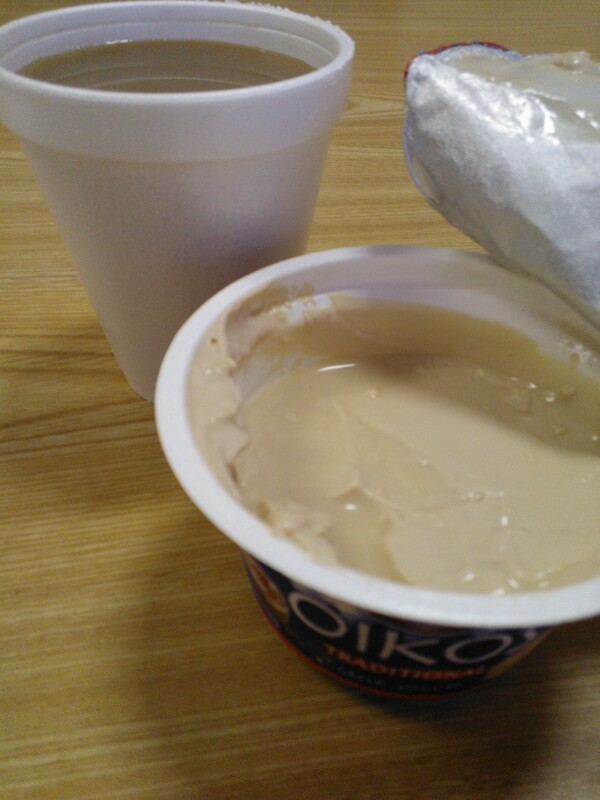 Mondays features were coffee and cafe… I saw OIKOS Cafe Latte Greek Yogurt, and I was curious. But I really liked it! It was smooth ans creamy with a mild coffee flavor, not espresso like I was expecting. Monday was miserable! It was pouring and gloomy. 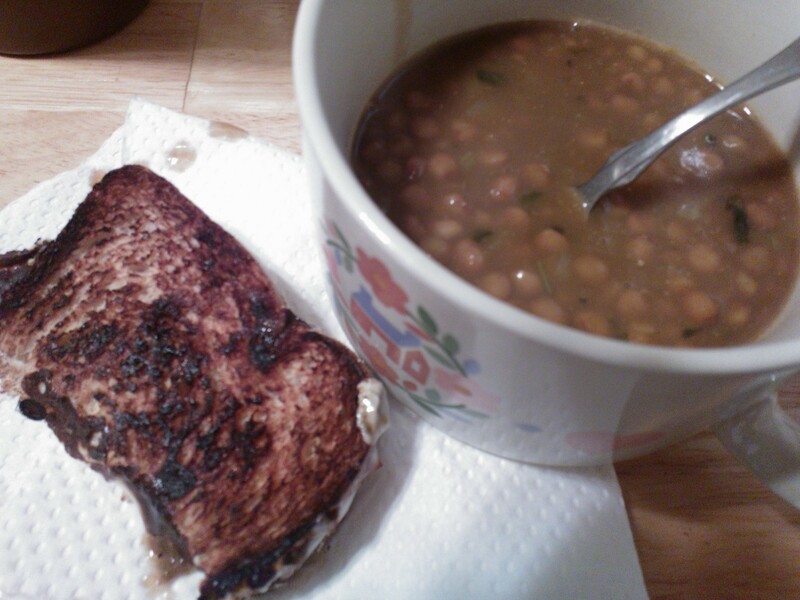 The best way to combat one of these days is with some soup: Lentil soup with some grilled ham and cheese! 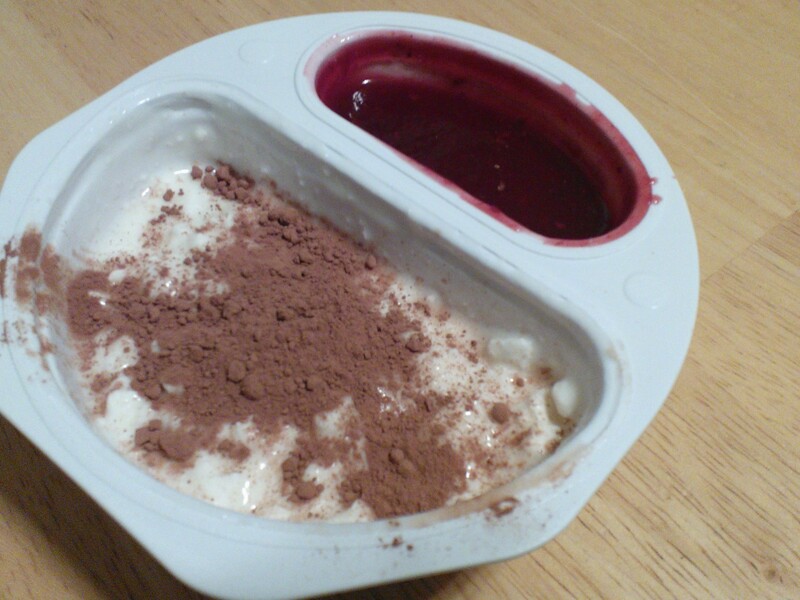 I still can’t find affordable raspberries, so I improvised for dessert to get my kick: Breakstone’s Raspberry Cottage Cheese Double, sprinkled with cocoa powder. This is it! Its so surreal! I finished all my paperwork and projects, and this is the day. 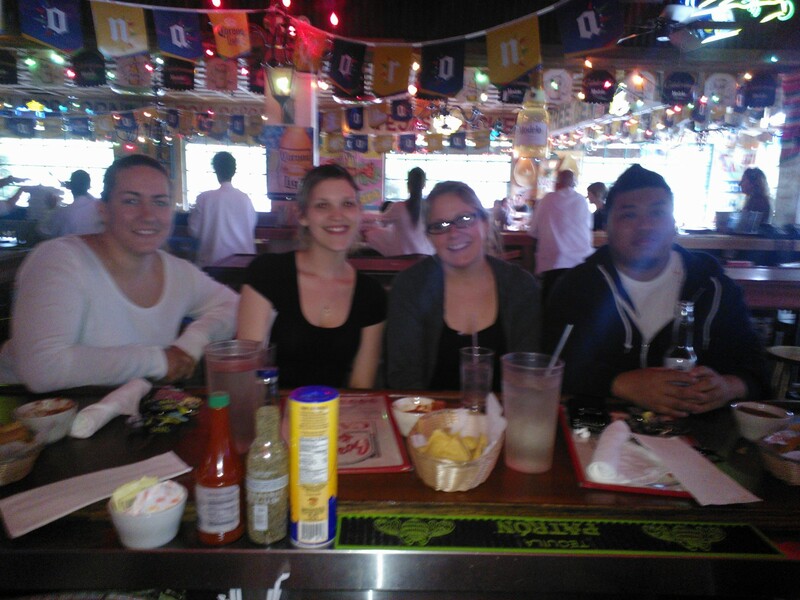 The LAST day of clinical as a nursing student! I was very attached to two of my patients and both they and I were said that I was leaving. I feel like I will visit them, though. I was actually contemplating applying for a job at this facility. I work with kids, but maybe my calling is to be with fragile patients. I’m not quite sure if a nursing home is the right start for a career for me, though. After we were finished on the unit, I hugged my patients, and met up with friends at Border Cafe, as we had done a few weeks earlier. I learned, today, that I really am a light weight. One rum and coke and I was toast! And it wasn’t even noon yet! Oh boy! After I sobered up I headed home to prep tonight’s dinner. Kathleen is a nurse that I work with. She also happens to be a Kappan alumnus (referring to Phi Theta Kappa). Anyway, Kathleen and I have a lot in common. She has been very supportive of me throughout my entire illness and recovery, as well as a cheerleader for my continued education. One thing Kathleen and I have consistently found in common is our love of food, especially ethnic foods! Although Kathleen and I usually talk about sushi and Indian food, I’m dedicating today’s recipe to her, as Kathleen is a vegetarian, and newcomer to the blog, and today’s recipe uses tofu. I’ve made this recipe before and loved it! Now, for a little tweeking. 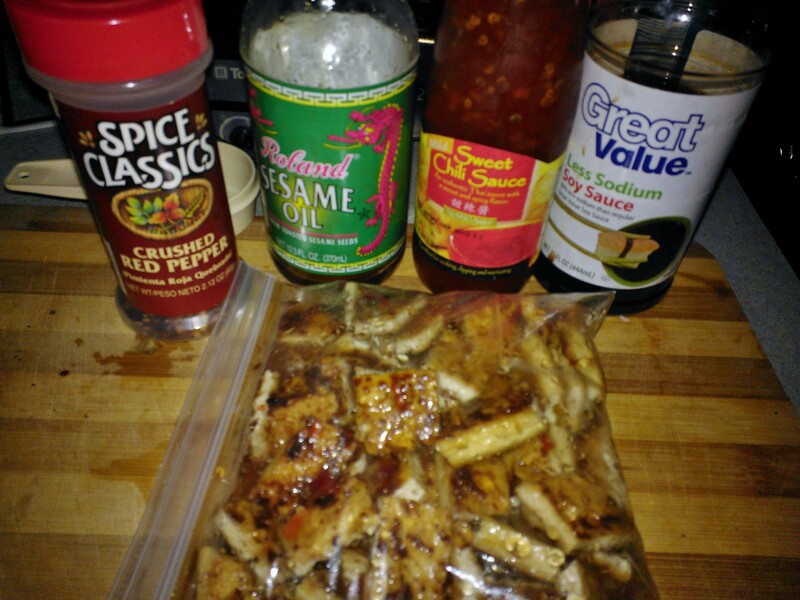 Combine all ingredients for the sauce except the cornstarch and set aside. Drain the water from the tofu and slice into 8 slices. 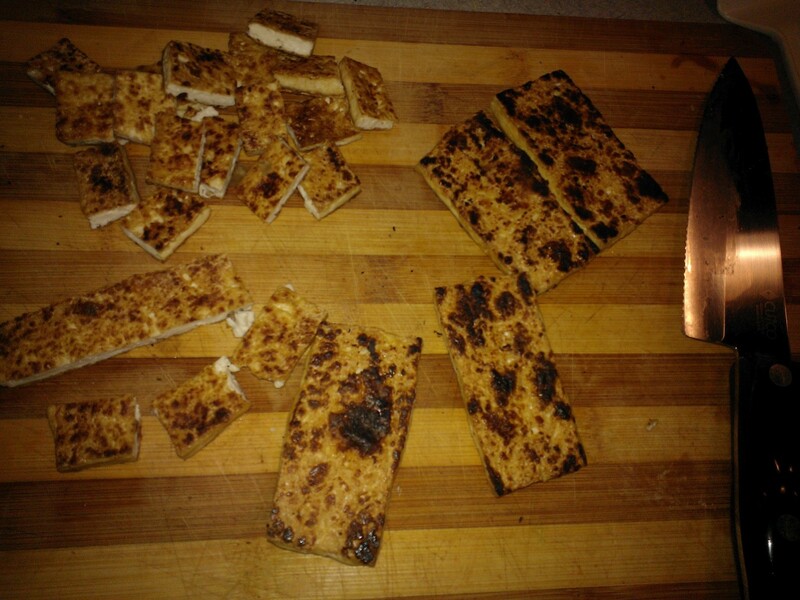 Lay the slices between a towel, and weigh the tofu and towel down with a pan (I used a nursing text book). Allow the tofu to sit for 30 minutes and for the towel to absorb the excess moisture. Spray a pan with nonstick cooking spray and “dry-fry” the tofu (AKA brown the tofu), pressing with a spatula occasionally to remove excess liquid. 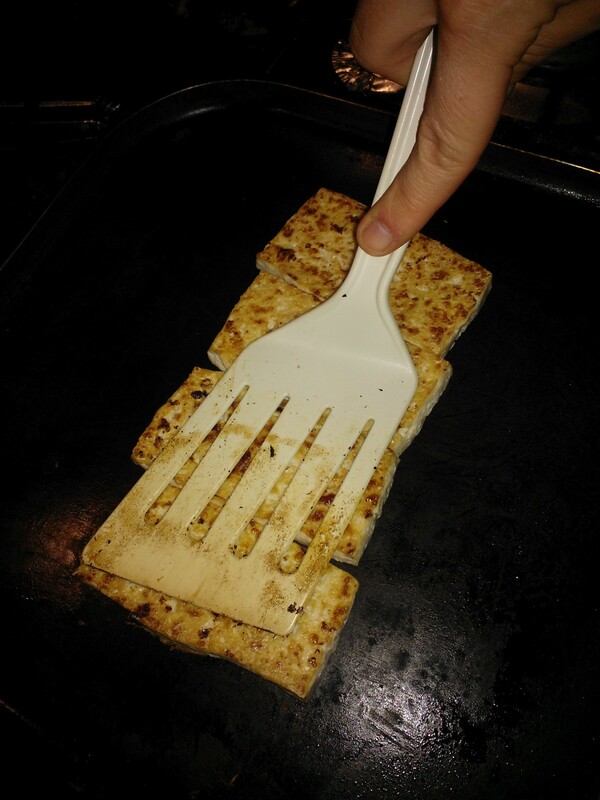 Once one side is toasty brown, flip and press the tofu again. When browned, remove from heat and let cool. When cool, cut each slice into 6 pieces. Place cubed tofu in a resealable baggie and pour in the sauce. Allow to marinate at room temperature, turning the tofu occasionally. 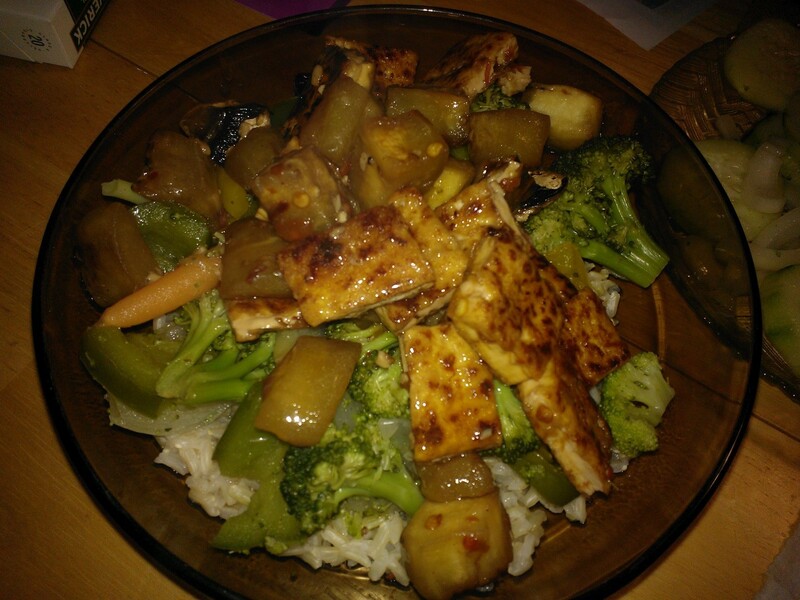 (The longer the tofu has to marinade, the more flavor it will pick up. I marinated mine for about 4 hours). 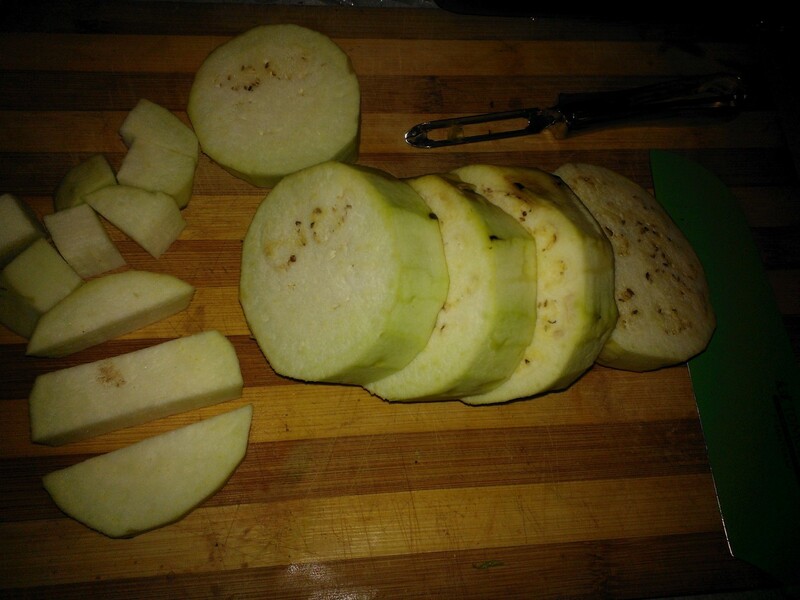 Meanwhile, roughly chop vegetables into large pieces and cube the eggplant. After marinating the tofu for a while, its time to cook. 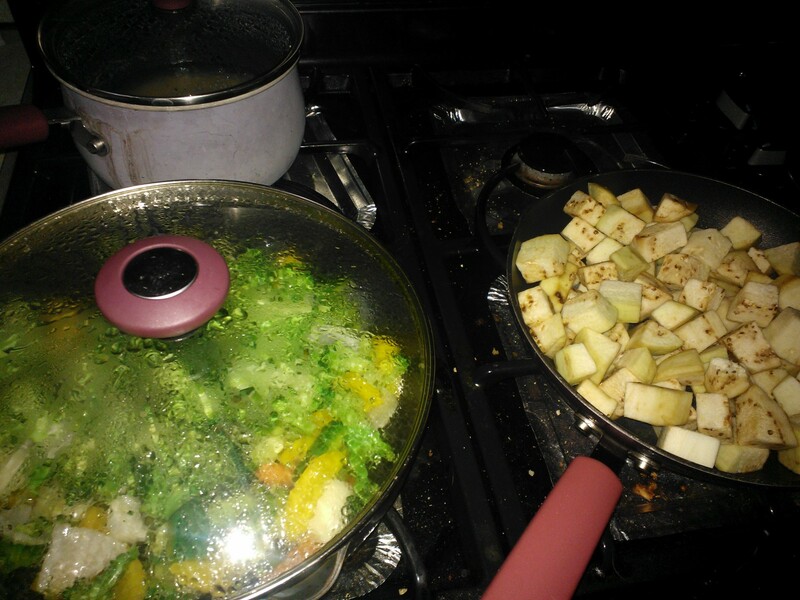 Spray a wok or large skillet with non stick spray, and on medium high heat, add the cubed the eggplant. Toss every so often to brown the sides and until the eggplant becomes fragrant. Add the minced garlic and empty the contents of the sealed marinating bag (tofu and marinade) into the skillet. Meanwhile, steam the vegetables as you would prefer to do so. (I used the stove). Make two batches of the sauce. Combine the water and cornstarch and stir until dissolved. Add the remaining sauce ingredients. (Remember to make two batches). Toss the eggplant and tofu and pour one completed batch pf sauce over the “meat” and toss. Lower the heat to medium/ medium-low. Add the last batch of sauce, toss, and allow to thicken. Toss all ingredients together and enjoy! Reading this recipe back, it sound a lot more complicated than it actually is. I promise! I love the sweet and spicy notes of this meal! Plus, I got dad to eat tofu! (Another added bonus: each serving is around 200 calories). I served dads meal over brown rice and mine over the remaining bag of Miracle Rice. 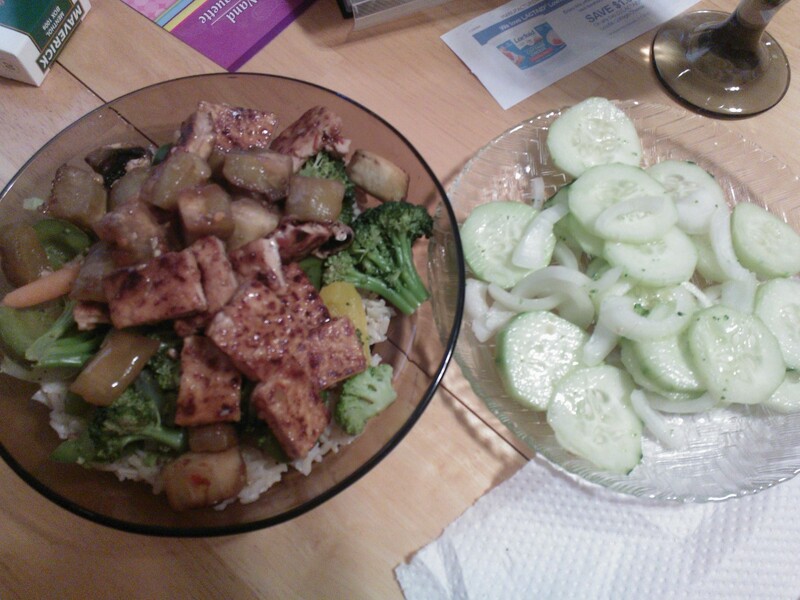 I also made a samosa salad with a thinly sliced cucumber, some onion, and a tablespoon of seasoned rice vinegar.